Welcome to the Red Cedar State Trail, one of Dunn County's premier natural and recreational destinations. Whether bicycling, skiing, hiking, walking or jogging - you will discover miles of spectacular natural beauty. 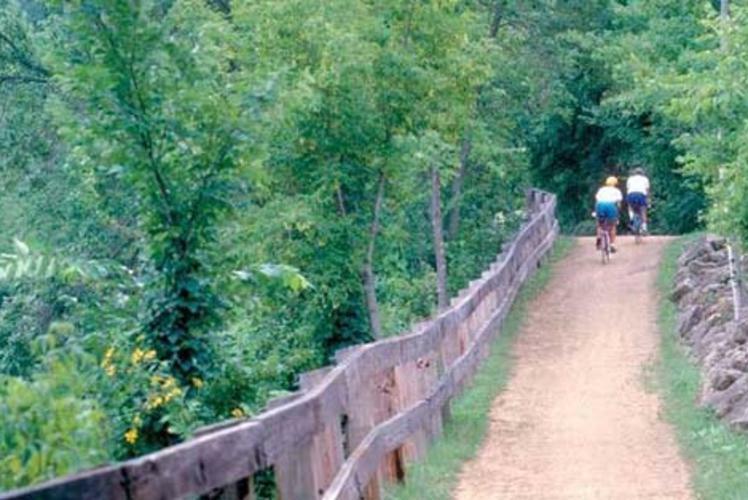 The Red Cedar Trail has a compacted limestone surface and meanders past towering sandstone bluffs and pastoral farmland, through deep, deciduous forests, sunny meadows, and expansive river bottoms. Sweeping vistas of the Red Cedar River are found along much of the 14.5 miles of trail. Be certain to slow your pace and enjoy the amazing diversity of animals and plants found here. This gently sloping, four-season trail rests upon the bed of a historic railway. The north trailhead is at the old Depot and contains historical and natural exhibits, sells trail passes, and is a visitor center for the City of Menomonie and surrounding area.